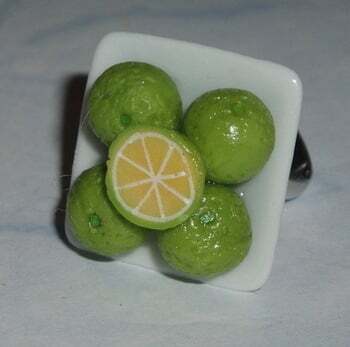 Really trendy Lively Limes on a Plate Ring with an adjustable silver plated ring band. Porcelain Plate is approximately 20mm across. The five Miniature Limes are handmade using fimo clay and securely glued to the plate. These are so cool and going to be a hot fashion trend for the summer.